While camping at the amazingly beautiful Opal Creek wilderness area I experienced a new type of injury: sandal chaff. Yes, the skin on my feet somehow where rubbed to oblivion by hiking in my trusty 11 year old Chaco’s. The source of the irritation still confuses me; never has such a thing happened prior or since. It’s probably no surprise that I prefer tea over tinctures. Yet, I often use tinctures for both myself and for others because of their ease of use. There’s no waiting for a pot of tea to brew, nor do you have to take cups of tea to work with you! 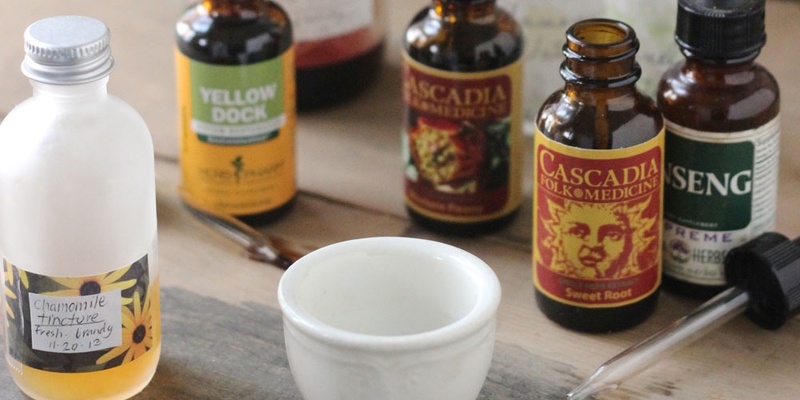 Tinctures have many benefits beyond these; the alcohol is a perfect medium to extract certain chemical constituents to create a concentrated herbal extract with a fairly long shelf life. Yesterday on the Summer Solstice, I used Chinese herbal formulating principles to create a Harmonizing tincture blend to soothe my acute upset stomach. Every time I go to work in my herb nook, I practically burst with appreciation. This is where I get to work?! Surrounded by herbs and oils and tins and bottles, things that I love playing with? Creating this little herb studio in my teeny tiny kitchen has been one of the best things I have ever done. It’s like a working in an alter. Do any of you have an herbal nook of your own? A space dedicated to storing and creating with herbs, whether it be a shelf in a cupboard or a room in a house? I’d love to hear about it! Tales of a mythical violet liqueur Two years ago, it happened to me. I became determined that I would make violet liqueur. My friend Susan told me about an incredible violet liqueur she found while traveling in Greece. With her experience as a bartender and world traveler, one could not take her praise of the violet liqueur lightly. I had made a few liqueurs before, some at Sage mountain in the herbal classes. Irish Creme, creamy coco damiana blends. They were delicious and surprisingly easy. I had seen Theresa Broadwine make liqueurs at Medicines from the Earth. I had even tried my hand at making dandelion wine. The idea of capturing the essence of violets was too much to shake. I wondered if I could possibly make one myself, if I could ever find that many violets to pick. Sometimes simple is good A few months ago, I experienced a lingering cough after an case of influenza. When it was a stronger, more irritating cough, I treated it aggressively with Planetary Formulas’ Old Indian Wild Cherry Syrup (plus other things). It’s strong stuff, but when I have had bronchial infections it has historically helped so much that I go straight to it. After the worst of the cough was gone, I reached for a tea of three simple herbs which are easy to harvest and created a tea general tea for the lungs that’s quite delicious. Three Herb Tea for Promoting General Lung Function Mullein – Verbascum thapsus. Red Cedar –Thuja plicata. Dried Tangerine Peel – Citrus tangerina. This summer I grew Feverfew for the first time, in a pot with Mexican Oregano and Dusty Miler. It grew well, and tolerated frequent harvest of its flowers and leaves for tincturing, sprouting new buds and growth many times. I hope it comes up next year so I can enjoy it all over again. Feverfew had always confused me. I rarely heard it used for any other use besides migraines, and since I rarely experience migraines or headaches myself or treat many headaches, I didn’t gain experience with it. It seems that there were differing opinion about it. Some said it was only good for headaches with specific indications, some said to take it as a prophylaxis daily for any sort of migraine. Some said it was overrated and some said it was highly reliable. New products soon to be in the shop! I am really excited to add a new herbal face care line. I have been using my own face toner, steam and oil serum for years now, so it feels good to finally perfect my formulas (for the time being, at least) and offer them in the shop. Another addition will be a nourishing hair oil, with jojoba oil. I love jojoba oil, it is so luxurious and is notably a little different from other oils as it seems to lock in moisture and balance oil production with long term use. At first I was concerned it would build up on the hair, but I haven’t found this to be the case at all. From my experience, it seems that waxes tend to build up, not oils. I also have a Cedarwood and Fir deodorizing body spray. Even though the scent is on the masculine side, I find myself wearing it almost daily. I just can’t get enough of that cedar scent. What’s your herbal story? How did you get here? What lessons are hidden in this journey to the plants, to nature and to herbal medicine? If you are like me, you have been asking yourself these and many other questions about how you fit in the grand scheme of this calling of working with the herbs. Here’s a gentle and tasty tea combining some of my favorite herbs to support the all-important brain-gut connection. It works on the nervous system and the middle jiao (digestion) to move Qi and ease stomach aches, increase healthy permeability and absorption in the gut, calms the emotions especially anxiety, is tonifying to worn-out adrenals, warms and increases circulation. I have just returned from an Italian vacation. Oh, the sights, the food, the plants and the ruins to be seen! One particular plant seen all over the place happens to be one of utmost importance: the Olive tree. Olive trees are all over the place. From afar they are easy to identify because of their round, squat crown and their distinctive pale silvery-green foliage.